Students at Eugene Lang College The New School for Liberal Arts have a reputation for being driven and finding their own path. 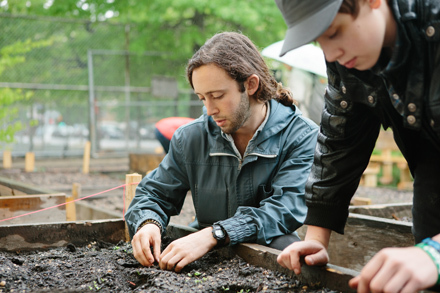 That doesn’t stop at the school’s doors; they spend their time outside of school teaching children about composting, producing plays, connecting communities to sustainable food, and countless other projects. Lang has always done all it can to support students goals, both in the classroom and beyond. And now there are new funds to help. Lang is currently accepting proposals for the first-ever Eugene Lang Opportunity Awards, which will offer funding to students pursuing independent projects. The awards come in two categories: Innovator Awards for applicant-generated efforts, and Outreach Awards for applicants taking part in pre-existing programs. The projects can be in any field of study or activism, and can be happening anywhere. The Awards are made possible by a generous grant from the school’s namesake, Eugene Lang. Innovation Awards are available for fall, spring, summer, and winter break projects, and are awarded to support self-designed co-curricular opportunities. Outreach Awards are available for fall, spring, and summer, and are awarded to support existing co-curricular opportunities in approved organizations and programs, including those offered by Civic Engagement & Social Justice, Study Abroad, and other departments. As part of the application process, students generate a proposed budget for achieving their project. This budget determines the size of their award: funding for projects can range between $1,000 and $5,000. The application deadline is February 20th. More information is available here.